This paper will investigate the pressures both the government and the domestic cell phone industry have placed on the counterfeit (Shanzhai) cell phone industry in China. Our research question is two-fold and is as follows: (1) Why has the government changed its approach toward Intellectual Property Rights (IPR’s) in the Shanzhai market? and (2) How have government and domestic firms contributed to the decline of the Shanzhai industry? By examining the government’s motivations on whether to enforce IPR’s, we find that the government values economic growth over the potential labor unrest that would result from shutting down these illegal firms. Our evidence shows that the government’s crackdowns on the Shanzhai cell phone industry are correlated with an increase in trademark applications and a decrease in trademark offences. Domestic firms such as Huawei have impacted the demand for Shanzhai products by creating brand value that differentiates them from their illegal imitations. This leads to consumers viewing Shanzhai phones and real phones as imperfect substitutes. The government has changed its approach towards the enforcement of IPR’s in the Shanzhai market because the benefit of collecting tax revenue from these firms operating in a legal context outweighs the cost of increasing temporary unemployment from shutting down the industry. The government has increased the number of raids and prosecutions to deter Shanzhai firms from continuing to operate illegally, pushing them to legitimize. Domestic firms have increased their brand awareness efforts to deter consumers from purchasing Shanzhai phones. Source: Guangdong.2016. Image. & Guangdong Province Map. 2016. Image. “Shanzhai” as a phrase commonly means something distant from official control.Its meaning has evolved over the course of Chinese history, but today it is most widely used to describe China’s counterfeit sector. 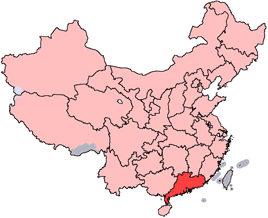 Most Shanzhaicompanies are located in the Pearl RiverDelta (PRD) in the province of Guangdong, mostly in the city of Shenzhen, shown in Figure 1. Our paper will focus on the mobile phone subsector of the Shanzhaiindustry.Shanzhaiphones can range from counterfeit to “reworked” legal phones that infringe on IPR’s to varying degrees (see Figure 2). Our paper does not distinguish between the different types of Shanzhai handsets, but rather uses “Shanzhai” to refer to the unofficial mobile phone industry and its products as a whole. The Shanzhai phone industry originated as a result of a 1999 government reform introducing the mobile phone manufacturing license system.The system created largebarriers to entry, causing many manufacturers to operate unofficially. Due to a lack of government enforcement of the license system, unlicensed manufacturers continued to operate without consequence. Moreover, these manufacturers kept up with current designs and technology trends by infringing on the IPR’s of internationally competitive brands such as Nokia and Apple.The government failed to protect these international corporations’ IPRs’, giving rise to the current Shanzhai handset market. Source: Wang, Kevin. 2010. "China Gray-Market Cell Phone Shipments Slow In 2011". IHS Technology. Shanzhai phone manufacturers are typically decentralized and small-scale, with 10 to 20 workerson average. However, “by using a numerous number of suppliers, they achieved the economy of scale even with a small amount of capital.”Furthermore, Shanzhai manufacturers are able to produce with low costs by avoiding official product testing and China’s value-added-tax, as well as by maintaining low research and development (R&D), promotional, and overhead costs.As a result, most Shanzhai phones are sold on average for around ¥600, whereas legal domestic and international phones are sold for an average of ¥1760 in China.This price advantage helped fill demand for low-priced phones, particularly in rural China.As a result, the Shanzhai industry had captured 30% of the Chinese mobile market by 2008.As shown in Figure 3, the industry experienced extensive growth, with sales of Shanzhai handsets increasing from 45 million in 2005 to 245 million in 2012. However, since 2011, the shipment of Shanzhai phones has declined, and by 2014 it had decreased by 35 percent to 160 million. This paper will investigate the role of two key actors, the government and domestic companies, in the fall of the Shanzhai phone industry. We narrow our cost-benefit analysis to tax revenue and unemployment because the government legitimizes itself through its economic success. By increasing tax revenue, the government can reinvest that money into infrastructure and other forms of development in order to further grow the Guangdong province. In contrast, a rise in unemployment is a sign of an economic failure as demonstrated by worker unrest and social instability. These two factors represent the trade-off between development and stability, or action and non-action by the government. After establishing why the government has changed its approach towards the Shanzhai industry, we move on to analyze its new approach and its effects. We first gather qualitative evidence on the government’s involvement and increase in crackdowns. Then, we look at various court statistics from the Supreme People’s Court and Chinese provincial courts throughout the country in order to determine if the government has increased its efforts to prosecute Intellectual Property Rights (IPR) cases.. We also collect data on the number of new applications for trademarks in the Guangdong Province to analyze how Shanzhai firms have responded to the government’s industry crackdowns. After collecting these primary and secondary sources, we compare the decrease of legal action to determine the effectiveness of the government’s approach. Lastly, we examine the efforts made by large domestic firms, such as Huawei, to increase brand awareness while simultaneously decreasing the demand for Shanzhai products. We use the microeconomic theory of perfect and imperfect substitutes as a lens to analyze the decline of the Shanzhai industry and the rise of the domestic brands. Huawei’s financial statements will give us insight into the success of various efforts to increase brand awareness and differentiate themselves from Shanzhai counterparts. In addition to our primary sources, we find third party reports on the effectiveness of Huawei’s branding efforts. The Chinese government values the Shanzhai industry for the social stability it offers in employing millions of workers; however, it balances that stability with the loss in tax revenue it would receive if these firms were producing legally sold mobile phones. According to a report by the global market research firm iSupply, the domestic counterfeit phone market produced an average of 151 million phones per year since 2006, reaching a height of 245 million phones in 2011.The South China Morning Post estimates that there are 20,000 to 25,000 Shanzhaifirms operating in Shenzhen, where most production is centered.Given that each firm employs about 10 to 20 workers, we estimate that there are 200,000 to 500,000 employees just in Shenzhen. Based on the size of the market and China’s focus on the development of its technology sector, there is clear government interest in encouraging rather than discouraging growth. A good measure of that growth is the potential tax revenue that stands to be gained from these firms producing legally manufactured cell phones that do not violate the IPR of foreign or domestic companies. This money could be spent on infrastructure projects in and around Shenzhen, from housing developments to new highways, to encourage more businesses to come to the region and to further the economic development of the area. This increase in tax revenue, therefore, can serve as a proxy measure of the overall growth and development as this revenue is not only a reinvestment into the community, but also a measure of the increased GDP of the province. Based on 2012 figures, in which 200 million Shanzhai phones were produced that sold for ¥600 each, there should have been taxable revenue of ¥127.8 billion, a number which could have been included in China’s GDP.It should be noted that this price of ¥600 is actually lower than the price point which could be expected for a legally produced phone, because the stigma of poor quality associated with a Shanzhai phone typically decreases its value. At the 25 percent tax rate of an average manufacturing firm, there would be another ¥32 billion which the Chinese government could dedicate to development projects.While this figuremay seem small in the context of China’s GDP, it would be significant for the region. However, two possible consequences of this mass shutdown of firms would be (1) social unrest, exemplified through worker protests and/or (2) a mass outflow of workers due to the huge percentage of migrants. The province of Guangdong is already facing the largest concentration of worker protests in the country. Between August 2015 and February 2016 there were over 280 labor protests in the province, while in 2013 there was less than a total of 100 protests in the entire country. Thus, social stability is a serious threat that the government is facing in the region already, and a massive layoff would further add to this. The second effect of a government crackdown on the operation of Shanzhai firms would be a mass outflow of workers resulting in a shock to the labor market. By shutting down hundreds, or even thousands of firms, the government would be drastically cutting the demand for labor and increasing unemployment. Given that much of the manufacturing of Shanzhai phones is centered in the Pearl River Delta (PRD) and Shenzhen, this effect would be concentrated in that region. There are about 9 million residents of Shenzhen and over 70 percent of are migrant workers, meaning that their household registration permits (hukou) differ regionally within China.In the event of a mass crackdown, the non-hukou residents would be forced to return to their registered location, mostly rural areas with less economic opportunity.The mass outflow of workers would also stunt the growth of the city that relies on migrant workers to populate it. A mass crackdown would hinder the government from achieving its goals of maintaining stability and growth. Instead, the government should encourage legitimization of Shanzhai firms, thereby keeping this developing sector employed and gaining tax revenue at the same time. The government has started to increase its crackdowns on the Shanzhai industry and we believe that its goal is to transition Shanzhai manufacturing firms into legal firms and have them adhere to stricter Intellectual Property Law. Our predictions and estimates of tax revenue and worker unrest help to justify why the government has taken action. The government has taken steps to decrease the number of counterfeit handsets in the market, through a two-pronged attack on the industry. The first involves confiscating phones and shutting down warehouses, which we will analyze through news articles and headline cases. The second way of dismantling the industry is through apparent increases in intellectual property protections; we measured this through various Supreme People’s Court (SPC) statistics and trademark applications. We conclude that the government crackdowns have had a significant impact on decreasing the number of handsets and it has pushed many companies to become fully legal. We use a combination of Shenzhen trademark statistics and Guangdong province patent applications as evidence for our conclusion. We will outline some headline cases that highlight the pressure the government is exerting on the industry. There have been several examples of the government cracking down on Shanzhaiphone manufacturers, specifically those producing iPhones. As the articles show, there is a progression of increasing government involvement in dismantling the industry; it starts with general crackdowns on the industry and moves to target Shanzhai specifically around 2011. Starting in 2008 reports show the government taking action against counterfeiting in large-scale crackdowns and manufacturing raids. For example, in 2010 the State Administration for Industry and Commerce reported that it had shut down over 6,000 trademark violation cases – firms, manufactures etc. – totaling about $120 million in goods.The government also reports that the value of the counterfeit goods taken out of the market isfar higher than it was in previous years and that they will continue this upward trend.However, many of the goods were not Shanzhai handsets, rather clothing or other electronics. It is not until several years after when the number of Shanzhai handsets reaches its peak (Figure 3) that there is an increase in government action specifically directed at this industry. In 2011, there is an uptick in the number of reported Shanzhai crackdowns, beginning with the arrests of five individuals for making and distributing fake iPhones.The officials confiscated approximately 200 phones.This is a small portion of the industry. But this crackdown demonstrated that most of the business in the fake cell phone market had moved out of the marketplace and into online forums, so it was harder for the government to track. Additionally, this raid was one of the first major crackdowns and at the beginning of the timeline. Furthermore, in 2011 officials also found that there were twenty-two fake Apple stores operating in the city of Kunming, and presumably hundreds more across the country. In July 2015, police raided a Beijing-based firm that was manufacturing and distributing fake iPhones on a massive scale.The police estimated that the company had made over 41,000 fake phones and hundreds of thousands of other cell phone parts.The officials estimated the firm had sold counterfeit goods worth over $19 million in 2015 alone.This case was one of the largest crackdowns ever made by the police. Additionally, they found that the firm had international distributors, resulting, resulting in the government issuing a public report stating that it would step up current measures to ensure that counterfeit and low-quality goods are not exported to Africa, the Middle East, and Latin America. The government argued that it wanted to make sure that only quality brands are exported and represent the Chinese economy well. Additionally, the report stated that greater restrictions would be set up along borders to ensure that quality goods are leaving the country. Finally, the report stated that, “The Ministry of Commerce also called on economic and commercial counselors in more than 140 countries to create specialized teams to protect the interests of Chinese brands.”Given the larger scale of crackdowns, in relation to those in 2011 and years prior, the government has increased pressure on the Shanzhai industry. Statistics on IPR cases in China’s court system show the government’s impact on the industry from another perspective. The SPC annual reports give a thorough breakdown to the number and types of cases taken by the Chinese courts at provincial as well as appellate levels. The 2015 report adds several elements to the IPR protection framework as well as setting new standards in trademark, copyright, and patent law. These changes include clarifications in law and are geared more towards upholding existing copyrights and protecting their owners.The annual report showed that Chinese patent owners won a larger percentage of cases than any other country in the world. The Court reports that patent owners have a success rate of about 68 percent; the next highest country is Germany at 66 percent. Our analysis of court statistics and trademark applications supports our media findings and also shows that many Shanzhai firms could be come full-fledged legal companies. As seen in Figure 4, the number of Shanzhai units shipped domestically decreased as the number of new IPR cases taken by the SPC increased. These are IPR cases taken against Shanzhai firms and are often prosecuted by the government. Source: Wang 2010 & China Industry and Commerce Press. "Annual Development Report On China's Trademark Strategy", (2009-2014). In addition to the number of new SPC cases taken per term, the overall number of IPR infringement cases across China in all courts has increased, as Figure 5 illustrates on the next page. Source: China Industry and Commerce Press. "Annual Development Report On China's Trademark Strategy", (2010-2015). The number of government prosecutions of IPR violations across the country has been increasing since 2009 (as seen in Figure 6). This provides evidence that these prosecutions are not only shutting down Shanzhai firms but also creating disincentives for new firms entering the market. In addition, the SPC reports identify continued legal action as one of the strategies to shutting down the industry. Figures 4 - 6 show a clear increase in legal action, both in the number of cases and the number of prosecutions of IPR infringement. This corresponds with an increase in the number of trademark applications in Shenzhen as seen in Figure 7. The number of applications remained fairly steady until 2013, when we see a more rapid increase and by 2015 the number of applications has more than doubled. This relationship shows that because of the increase in legal action, counterfeit firms are starting to push for trademark protections and legitimization, effectively leaving the illegal market. Firms find it easier and more cost-effective in the long run to legitimize than to face the costs associated with operating as an illegal firm. If caught the counterfeit companies could face not only large fines and confiscation of materials, but also imprisonment. 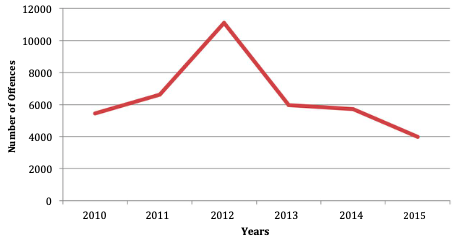 Furthermore, not only have the trademark applications increased in Shenzhen, but the trademark offenses have also decreased in the same time frame, as seen in Figure 8. This further supports that existing Shanzhai companies are legitimizing through applying for trademarks. In sum, the government’s crackdowns have had a significant impact on decreasing the number of Shanzhai counterfeiters through raids as well as increased legal measures. In recent years this had the effect of making more companies legitimize and file for trademarks themselves. We found that the number of legitimate companies may increase significantly in the coming years. Some of these companies could compete with Huawei or Xiaomi. Therefore, government action could contribute to the creation of key domestic firms and the strengthening of the IPR protections for current firms. Many domestic companies such as Huawei and Xiaomi originally started in the Shanzhai industry but have grown to become leading domestic firms in China.In most developed countries, their status would give them heavy bargaining power to lobby the government to increase IPR. However, we have not found evidence of a bottom-up approach by domestic firms. Nonetheless, these domestic companies care about the threat the Shanzhai industry poses to them and have found alternative strategies through building brand consciousness. Economists would view two identical phones by different producers as perfect substitutes. If one of these phones is cheaper than the other, the theory suggests that the cheaper phone will be consumed. This was the case in China in 2008, when Shanzhai phones made up more than 30 percent of the market while market share for international brands decreased to 50 percent (down from 90 percent in 2000) and domestic brands made up less than 20 percent of the market.Since Shanzhai phones were identical and cheaper than their real counterparts, they were perceived as perfect substitutes and held a considerable portion of the market. However, as seen in Figure 10, the shipment of Shanzhai phones has decreased since 2011 while the sales for domestic brands has increased because the products have become imperfect substitutes in the mind of the average Chinese consumer. In other words, despite the products being physically identical and Shanzhai phones less expensive, consumers prefer the real brand to the counterfeit brand. This is due to the domestic companies’ efforts to increase brand awareness and preserve their brand image, which has attached a social stigma to the concept of owning a Shanzhai phone. The concept of branding to Chinese companies has only recently become important. Because most companies were previously state-owned and there was no competition for market share, they did not worry about branding because they knew their products would sell.Now, as China has become more of an open market economy and introduced more foreign competition, domestic companies have had to re-strategize. Nonetheless, domestic brands such as Huawei have been committed to increasing their brand awareness and their efforts have been effective. In 2015, Huawei was one of the only two Chinese companies to earn a spot on the Interbrand’s Best Global Brands report, with the other being Lenovo.As seen in Figure 11, mainly through advertising and sponsorships, Huawei has aggressively increased their brand awareness both domestically and internationally since 2012. By 2015, 76 percent of people globally were familiar with Huawei while 97 percent of people in China knew the brand. Net Promoter Score (NPS is a Key Performance Indicator (KPI) which ranges from -100 to 100 that measures the likelihood a consumer will recommend a brand and is used to gauge brand loyalty. Huawei’s NPS improved from -24 in 2013 to 47 in 2015. Following increased branding efforts, Huawei’s NPS exponentially grew in a span of two years, improving its reputation. Huawei has not only increased its brand awareness, but it has also redefined itself as a “value creator”, through investmentinvestment in R&D. As seen in Figure 12, the company has increased its R&D expenditure, effectively tripling it in the last five years. Huawei has also reshaped its brand image by understanding “that the mobile market is now all about the customer service experience and no longer just a telecoms commodity.”Huawei has taken a “user-centric approach [that] focuses not only on availability, but also on key factors such as accessibility, integrity, retainability and ultimately a customer’s emotional experience.” By taking this approach and personalizing the experience, Huawei has differentiated itself from other low-cost mobile producers, effectively strengthening its reputation. Moreover, Huawei has attempted to preserve its brand by directly countering the Shanzhai industry. Since Shanzhaiproducts are known to break easily, produce excessive radiation, and catch fire, Huawei fears that their brand image could be affected if consumers believe counterfeit products are authentic Huaweis.As a solution, Huawei encourages consumers to bring their phones to Huawei stores to verify if they are real.Similarly, other domestic firms like Xiaomi have set up online platforms where customers can use phone codes to check the product's authenticity. Huawei has made efforts to increase its brand awareness as well as to redefine and preserve its brand. The company has become the “third largest mobile phone producer in the world, with an impressive share of 8.7 percent in the global smartphone market in the first quarter of 2016.”The company believes that its branding strategies have directly contributed to its increase in sales.Although Huawei’s main branding objective is to “ramp up competition against premium rivals Apple and Samsung”, its branding appears to be affecting sales for the Shanzhai market as well. We believe domestic firms like Huawei have differentiated themselves from Shanzhaiphones by creating a brand that Shanzhai producers cannot replicate. In doing so, domestic firms have transformed the market by changing the perception of counterfeit phones as perfect substitutes, increasing demand for authentic phones and decreasing demand for the Shanzhaiindustry. The overall decrease in domestic smartphone prices and the growth of affluent consumers could also have helped contribute to the switch in demand.Huawei may be only one of the first influential brands in China but we believe they have begun a trend for non-counterfeit companies to increase their brand awareness and compete against global competitors in order to capture more of the Chinese market, effectively reducing Shanzhai’s market share. Given that the industry we are studying operates illegally, it was difficult to find multiple sources in order to verify the numbers we found. For example, our primary source for measuring the size of the Shanzhai market was from the market research firm iSupply, which belongs to the internationally renowned company Information Handling Services (IHS). Although this is a highly reputable source that is quoted in a large percentage of our other cited sources, there is no clear information about how the data was collected. Our analysis would benefit from more diverse data sets. We suggest that more primary research be done on the number of Shanzhai units sold in the marketplace and on online forums. More current data is needed to show where the market has moved and if it has in fact slowed down. The data we collected from the SPC and lower courts could be inaccurate due to government incentive programs and payment structuring. We are unable to find third party sources for the number of cases handled by the Chinese court system. Without further information on payment structures and incentive programs, we are unable to determine whether these would skew the data positively or negatively. While the SPC takes more IPR cases each year and this could show that it is putting more weight on these cases and spending more time deciding them, we do not know if the SPC is simply taking on a larger caseload each year, which would thereby skew the percentage of IPR cases from the total caseload. Another limitation on our analysis is the limited time frame, as there are only a few years of data collection on the Shanzhai industry. This limited us from doing any further statistical analysis, or even interpreting trend lines because our graphs typically span 4 to 5 years. With more detailed data or a longer time frame, this analysis could have further clarified the influence that Huawei and the government have had on the Shanzhai industry. A drastic increase in exports to the Middle East and Africa indicates that the Shanzhai industry is pivoting towards those regions. Incomes are typically lower in these regions, so the low price point of the average Shanzhai phone still fills an important gap in the market. While the data suggests a decreased demand for Shanzhaiphones, the new expansion to Africa and the Middle East could reverse this trend in the new few years. Further analysis should be done in the future to study how this expansion has affected and will continue to affect the market. The Shanzhai phone market appears to be declining due to both government legal action and brand-building. We are reluctant to claim that one of these factors outweighs the other in terms of effectiveness, as both the domestic companies and the government have large vested interests in the Shanzhai industry’s decline. Overall, we found the government has been effective in controlling and reducing the supply of the Shanzhai handsets. We can examine the government’s approach through the case study of Shenzhen. The government’s “Made in China 2025” initiative shows that it plans to encourage more innovative growth in Shenzhen. The government has an interest in preserving the innovative techniques used in Shanzhai handsets and thus should encourage firms to legitimize. The tax revenue that could be gained from legal production is an additional incentive for the government as that money can be used for developing the province, however, the potential labor unrest that would result from a mass shutdown of firms would be a concern in the short run. If the government gave the firms incentives to legalize, unemployment and social instability would not be an issue. In the second section, we discuss the government’s action of raids and crackdowns, as well as prosecutions and legal action. Although the government may take precautions against labor unrest, the amount of prosecutions and court cases involving IPR has increased significantly in the last five years. As a result, in Shenzhen and Guangdong, we identified an increase in applications for trademarks, patents, and copyright protections, while also observing a decrease in trademark infringement. Therefore, we conclude that many Shanzhai companies have begun to legitimize. Finally, we discuss the role of key domestic brands in China and their influence on the industry. These brands have shifted the demand away from Shanzhai handsets by building a brand image and marketing strategy, thus increasing overall brand awareness. We find that brand awareness made the Shanzhai handsets imperfect substitutes for the phones produced by these domestic firms, shrinking the demand for Shanzhai. We find that the role of these domestic brands is only growing in importance, as each year more companies enter the Chinese cell phone market. The post-Shanzhai manufacturers appear to be a natural solution to the government tradeoff. Therefore, the government could further incentivize the manufacturers to legalize in the future. Given the unique market power that the government has and how integrated the counterfeit market is in the industry, it is unlikely that the tradeoff and push towards development would happen the same way in another economy. Ford is a senior in the Business and Political Economy program at NYU Stern with a minor in Computer Science. He is particularly interested in cross-border business, finance, and technology. He has had the opportunity to visit over 25 different countries across three continents in the lasttwo years. Ford currently works in the Wealth Management division of Morgan Stanley. When he is not studying or working he enjoys being outdoors, cooking, and playing billiards. You can reach Ford at ford.deihl@stern.nyu.edu. Zoé Macias is a senior in the Business and Political Economy program at NYU Stern. She is particularly interested in FinTech and closing the financial literacy gap. Zoé has had theopportunity to live in and travel to over thirty countries across four continents. After graduation,she will join Mizuho Securities in Equity Capital Markets. When not at her desk, Zoé can befound in the kitchen making something delicious. She also loves walking her dog, Kozmo, in Central Park and crafting the aesthetic of her apartment. Rebecca is a senior at NYU Stern studying Business and Political Economy with a minor in History. She has spent the past three years studying in New York, Shanghai, and London, resulting in an unconventional academic journey, and equipping her with the ability to examine and analyze current events through a lens that is both global and interdisciplinary. Rebecca hopes to enter the field of public policy after graduation, with a focus on capacity-building and economic development. "Case Study: Huawei's Global Brand Strategy". 2016. Branding Business. Accessed December 10. http://www.brandingbusiness.com/case-studies/huawei. "China's Copycat Manufacturers Are Now Pushing The Boundaries Of Innovation". 2015. South China Morning Post. http://www.scmp.com/native/business/topics/invest-china/article/1802238/chinas-copycat-manufacturers-are-now-pushing. "Chinese National Admits Selling More Than $1 Million In Counterfeit Cell Phone Parts". 2016.https://www.ice.gov/news/releases/chinese-national-admits-selling-more-1-millon-counterfeit-cell-phone-parts. “Chinese ShanzhaiHandset Market Research Report.” Report. Sino-MR, 2013. Guangdong Province Map. 2016. Image. Accessed December 10. http://www.map-china.com/guangdong-s-ow.shtml.htm. Huawei,. 2009-2015. Annual Report. Huawei. "Premier Li Encourages ‘Made in China 2025’ in Shenzhen." The State Council for the People's Republic of China. October 13, 2016. http://english.gov.cn/premier/photos/2016/10/13/content_281475465638379.htm. "Shanghai (Shanghai) City Information." China's City' Economic Data. 2013. http://www.chinaknowledge.com/CityInfo/City.aspx?Region=Coastal&City=Shangha i. "The SPC's 2015 IP Report Sets New Standards". 2016. China Law And Practice. http://www.chinalawandpractice.com/sites/clp/2016/09/28/the-spcs-2015-ip-report-sets-new-standards/. Analysis of China’s Shanzhai Electronic Products. Report. Beijing: Samsung Economic Research Institute, 2010. Bastin, Mike. 2016. "Huawei Showing The Way Forward For Chinese Brands". China Daily. http://www.chinadaily.com.cn/opinion/2016-05/31/content_25544380.htm. Bland, Ben. "Shenzhen, China, a Silicon Valley of Hardware." Financial Times, May 3, 2016. https://www.ft.com/content/2c38ccb8-0ad8-11e6-b0f1-61f222853ff3. Bo, Qiu. 2010. "Campaign Busts Brand Copycats In 6,000 Cases". China Daily. http://www.chinadaily.com.cn/china/2010-12/29/content_11768661.htm. Cai, Fang, Albert Park, and Yaohui Zhao. "Chapter 6: The Chinese Labor Market in the Reform Era." In China's Great Economic Transformation, edited by Loren Brandt and Thomas G. Rawski, 167-214. Vol. 1. Cambridge: Cambridge University Press, 2008. Chew, Jonathan. 2015. “Huge Apple Iphone Counterfeit Operation Shut Down In China”. Fortune. http://fortune.com/2015/07/27/police-china-fake-iphone/. China Industry and Commerce Press,. 2016. "Annual Development Report On China'sTrademark Strategy (Years 2009 - 2015)". Supreme People’s Court. Accessed December 10. Denyer, Simon. 2016. "Strikes And Workers’ Protests Multiply In China, Testing Party Authority". Washington Post. https://www.washingtonpost.com/world/asia_pacific/strikes-and-workers-protests-multiply-in-china-testing-party-authority/2016/02/24/ca ba321c-b3c8-11e5-8abc-d09392edc612_story.html?utm_term=.e5ff59406582. Goovaerts, Diana. 2016. "Huawei Aims To Boost Consumer Awareness With Brand Plan".Wireless Week. https://www.wirelessweek.com/news/2016/04/huawei-aims-boost-consumer-awareness-brand-plan. Horwitz, Josh. "Average Selling Price of a Smartphone, China and India." Atlas. September 07, 2015. Accessed December 10, 2016. https://www.theatlas.com/charts/4JB5KvUp. The Chinese ShanzhaiModel: Alternative Path To Growth, Cross-Specialization Partnership, And Opportunistic Niche Infiltration". PICMET 2010 TechnologyManagement For Global Economic Growth. doi:978-1-890843-21-2. Hu, Jin-Li, Hsiang Tzu Wan, and Hang Zhu. 2011. "The Business Model Of A ShanzhaiMobile Phone Firm In China". Australian Journal Of Business And ManagementResearch 1 (3): 52-62. Hu, Xiaochu. 2012. “China’s Rural-to-Urban Migrants: In Search of Fortune, Happiness, and Independence”. Jie, Yang. 2015. "Chinese Firm Made Fake Iphones Worth $19.4 Million, Police Say". The Wall Street Journal. http://blogs.wsj.com/chinarealtime/2015/07/27/chinese-fim-made-fake-iphones-worth-19-4-million-police-say/. Joseph, Kezia. 2016. "Huawei Claims Brand Awareness Boosts Revenues". Mobile Today. http://www.mobiletoday.co.uk/news/industry/40917/huawei-claims-brand-awareness-boosts-revenues-.aspx. Kennedy, Scott. "Made in China 2025." Center for Strategic and International Studies. June 1, 2015. https://www.csis.org/analysis/made-china-2025. Liu, Xuefeng, Yuying Xie, and Mangui Wu. "How Latecomers Innovate through Technology Modularization: Evidence from China's ShanzhaiIndustry." Innovation: Management, Policy, and Practice 17, no. 2 (February 03, 2015): 266-80. doi:10.1080/14479338.2015.1039636. O'Neill, Michael. 2013. "Sun Setting On China's Shan Zhai Phones". Weber Shandwick Asia Pacific. http://webershandwick.asia/sun-setting-on-chinas-shan-zhai-phones/. Salaam, Dar es. 2016. "Huawei Counters Bogus Handsets". The Citizen. http://www.thecitizen.co.tz/News/Business/Huawei--counters-bogus-handsets/1840414-3093430-i2evfr/index.html. Shira, Dezan. "Tax Incentives for High-tech Companies in China - China Briefing News. "China Briefing News. September 28, 2015. Accessed December 4, 2016. http://www.china-briefing.com/news/2015/09/29/tax-incentives-for-high-tech-companies-in-china.html. Skilton, Mark. 2016. "How China's Huawei Is Taking On Samsung And Apple". TheConversation. http://theconversation.com/how-chinas-huawei-is-taking-on-samsung-and-apple-52838. Soo, Zen. 2015. "Attack Of The Clones: Xiaomi And Samsung Biggest Victims Of China’S Market For Fake Smartphones". South China Morning Post. http://www.scmp.com/tech/social-gadgets/article/1838612/attack-clones-xiaomi-and-samsung-biggest-victims-chinas-market. Takada, Kazunori. 2011. "Fake Iphone Ring Busted In China: Report". Reuters. Trenholm, Richard. 2014. "Huawei Reboots Its Image With New Honor Brand". CNET. Truong, Alice. 2015. "Huawei’S R&D Spend Is Massive Even By The Standards Of American Tech Giants". Quartz. http://qz.com/374039/huaweis-rd-spend-is-massive-even-by-the-standards-of-american-tech-giants/. Office of Drugs and Crime. Rights In China" 2 (3): 56-62. Wang, Kevin. 2010. "China Gray-Market Cell Phone Shipments Slow In 2011". IHSTechnology. https://technology.ihs.com/388766/china-gray-market-cell-phone-shipments-slow-in-2011. Wang, Xin Yuan. "Chinese Low-end Smartphone Market: The Era of ‘Shanzhai’ Has Passed, Budget Smartphones Dominate." Global Social Media Impact Study. May 06, 2015. Wilson, Karl. 2016. "Companies Wake Up To The Benefit Of Brands". China Daily. Xingguang, Jiang. 2016. "China's Fight Against On IPR Infringement, Fake Goods". Supreme People’s Court.http://english.court.gov.cn/2016-06/01/content_25446542.htm. Chinese Shanzhai Handset Market Research Report. Report. Sino-MR, 2013. Pengfei, Zhang. 2009. "ShanzhaiAnd Shenzhen". IEEE Solid-State Circuits Magazine. "Shanghai (Shanghai) City Information." China's City' Economic Data. 2013. [4 ] Bland, Ben. "Shenzhen, China, a Silicon Valley of Hardware." Financial Times, May 3, 2016. Liu, Xuefeng, Yuying Xie, and Mangui Wu. "How Latecomers Innovate through Technology Modularization: Evidence from China's Shanzhai Industry." Innovation: Management, Policy, and Practice 17, no. 2 (February 03, 2015): 266-80. doi:10.1080/14479338.2015.1039636. Hu, Jin-Li, Hsiang Tzu Wan, and Hang Zhu. 2011. "The Business Model Of A Shanzhai Mobile Phone Firm In China". Australian Journal Of Business And Management Research 1 (3): 52-62. Horwitz, Josh. "Average Selling Price of a Smartphone, China and India." Atlas. September 07, 2015. Hsiang Kao, Hung and Jen-Fang Lee. 2010. "An Investigation Into The Key Elements Of The Chinese Shanzhai Model: Alternative Path To Growth, Cross-Specialization Partnership, And Opportunistic Niche Infiltration". PICMET 2010 Technology Management For Global Economic Growth. doi:978-1-890843-21-2. Kennedy, Scott. "Made in China 2025." Center for Strategic and International Studies. June 1, 2015. "Premier Li Encourages ‘Made in China 2025’ in Shenzhen." The State Council for the People's Republic of China. October 13, 2016. "China's Copycat Manufacturers Are Now Pushing The Boundaries Of Innovation". 2015. South China Morning Post. Shira, Dezan. "Tax Incentives for High-tech Companies in China - China Briefing News." China Briefing News. September 28, 2015. Accessed December 4, 2016. Denyer, Simon. 2016. "Strikes And Workers’ Protests Multiply In China, Testing Party Authority". Washington Post. Hu, Xiaochu. 2012. “China’s Rural-to-Urban Migrants: In Search of Fortune, Happiness, and Independence”. Migration Policy Institute. Bo, Qiu. 2010. "Campaign Busts Brand Copycats In 6,000 Cases". ChinaDaily. Chew, Jonathan. 2015. "Huge Apple Iphone Counterfeit Operation Shut Down In China". Fortune. Jie, Yang. 2015. "Chinese Firm Made Fake Iphones Worth $19.4 Million, Police Say". Wall Street Journal. Salvacion, Manny. 2015. "China Vows To Prevent Counterfeits From Being Exported Abroad".Yibada. China Law and Practice. 2016. "The SPC's 2015 IP Report Sets New Standards". 2016. China Law And Practice”. Van Egmond, Alex. 2015. "Away From The Shanzhai-Route: Intellectual Property Rights In China" 2 (3): 56-62. Wilson, Karl. 2016. "Companies Wake Up To The Benefit Of Brands ". China Daily. Bastin, Mike. 2016. "Huawei Showing The Way Forward For Chinese Brands". China Daily. Truong, Alice. 2015. "Huawei’SR&D Spend Is Massive Even By The Standards Of American Tech Giants". Quartz. "Case Study: Huawei's Global Brand Strategy". 2016. Branding Business. Accessed December 10. Skilton, Mark. 2016. "How China's Huawei Is Taking On Samsung And Apple". The Conversation. United Nations Office of Drugs and Crime,. 2016. The Illicit Trafficking Of Counterfeit Goods And Transnational Organized Crime. Vienna: United Nations Office of Drugs and Crime. Salaam, Dar es. 2016. "Huawei Counters Bogus Handsets". The Citizen. Soo, Zen. 2015. "Attack Of The Clones: Xiaomi And Samsung Biggest Victims Of China’s Market For Fake Smartphones". South China Morning Post. Joseph, Kezia. 2016. "Huawei Claims Brand Awareness Boosts Revenues". Mobile Today. Goovaerts, Diana. 2016. "Huawei Aims To Boost Consumer Awareness With Brand Plan". Wireless Week. O'Neill, Michael. 2013. "Sun Setting On China's Shan Zhai Phones". Weber Shandwick Asia Pacific.